Share your Doceri project to Twitter, Facebook, YouTube or keep your distribution more exclusive. 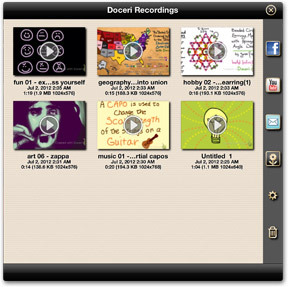 Screencast videos – projects which you replay while recording an audio voice over – are saved in your My Recordings folder. 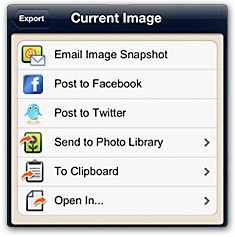 From there, videos can be compressed or left at their original size, and shared to your Camera Roll, as an email attachment or via Facebook or YouTube. The video is saved in standard MP4 format and you retain control over where your work is shared – we won’t make you upload it to a specific Web site in order for it to be viewed. At any point in your Doceri project, you can share a still screen image to your Camera Roll, Twitter, Facebook or as an email attachment. Once you’ve completed a multi-page project you may want to share it as single or a multi-page PDF file via email.